Also, totally forgot to bring my journal today so this week is a blur. A lot of this week was quite normal. Classes, studying, teaching etc. I am so burnt out,(being inside all day besides 45 min. of gym is hard) I guess that’s what happens when you’ve been here for almost 6 weeks. I have no idea how my dear friend Jenn Knutson was here for 16 weeks because of flooding in thailand (where she was supposed to go). The days go by slowly here but the weeks ZOOM by. I’d like to share about one experience this week that really meant a lot to me.It really got me contemplating about some things in my life and I hope it does for you to. On tuesday we went to choir practice. No you don’t have to try out or anything so don’t get too excited. Anyone can come and sing and you’re in, and you get good seats for devotionals. But you know I like to sing (as long as I’m not by myself) so I love choir practice. Our teacher/conductor is a stud. Brother Edgett (spelling?) he is an institute teacher in Orem and man can he sing. His voice sounds like chocolate cake -best way to describe it, moist, rich chocolate cake…this isn’t an infatuation simply a compliment. My district will attest to this. ANYWAYS not the point, the point is every choir practice is basically a fireside. We always sing hymns for the choir piece for devotionals but they’re 4 part arrangements that are just beautiful. And we actually talk about the lyrics of what we’re singing, the feelings that these words touch on and how they APPLY to us (application is so important, can’t say that enough). This week we sang “Where Can I Turn For Peace?” hymn 129. We worked on our parts going over measures and crescendos etc. Then he would stop us and ask a question about the lyrics such as; “What are the sources in our lives that cease to make us whole, why?” He went on to talk about how many people in this world are lost. When hard times come in their lives (which we all experience) that they may turn to alcohol, drugs, counselors,friends, family, exercise etc. for relief. And although some of these are good (not the first 2) do they really leave us feeling fully at peace. Completely relieved of a burden that was once there. Is the guilt gone, the anguish calmed, and our souls strengthened? He then went on to say that the only way that any of us can ever befully healed is through the Savior. I know in my own life that I’ve experienced so much love and support from friends and family when I’ve experienced my own trials…but I know that I would not be where I am today without the Savior. He is the one who ” …reaches my reaching, in my Gethsemane, Savior and Friend”. As we continued to practice he talked about the only thing that we should do that night (at devotional) is to teach. Even if we hit a few wrong notes or sped up when we weren’t supposed to etc. that that night we were teaching these people we sang to. This song had a message, yes it was beautiful but there was point that needed to be taught. As missionaries that’s what we do! We are constantly inviting and helping people to know of their Redeemer Jesus Christ and invite them to come unto Him. To turn to HIM for peace. Where in our need to know, we can run to Him. It is His hand that can calm our anguish. Who, who can understand? He, only One. Part of the arrangment included the 4 sections overlapping eachother singing that last statement “He, only One.” Just as Peter walked on the water and realized that HE was in fact walking on water towards the Savior began to sink beacuse he doubted. He reached his hand up out of the water pleading with Christ “Lord, save me” and there Jesus was to reach his reaching hand to pull him up. The same is with us, if only we would reach. If only people knew that this life is to be full of happiness and joy as we overcome experiences that may be difficult. This can be done through the Savior and His atonement. He knows HOW to heal us because He’s been there. No one else, but He only One. The atonement performed by Jesus Christ allows us all to be able to come to Him and be healed in every way possible. The atonement was infinite and is extended to all. There is not a single person on this earth that cannot access to the love and mercy that Christ gives to us, through Him we can change, become better, let go of guilt, or be relieved of sorrow. What a blessing. Many people ask why I’m so happy? -this is why. I don’t have to remain in sadness or pain ever we can come unto Christ and be happy, not just for a little while but forever. This gospel is everlasting. Think about that. How often can we find things that last forever? I love you all, I know that this gospel is true. This is HIS church, the Church of Jesus Christ of Latter-day Saints. As a missionary I’ve better come to see that every day. It’s not a cult, or a brain washed group of naive people…these are real people with variety of lives (see mormon.org) that know that their families can be together forever, that they can be clean and happy through the atonement of Jesus Christ and that this mortal life is only a small part of the plan of our Heavenly Father. We are God’s children, ALL created in His image but each of us are different. 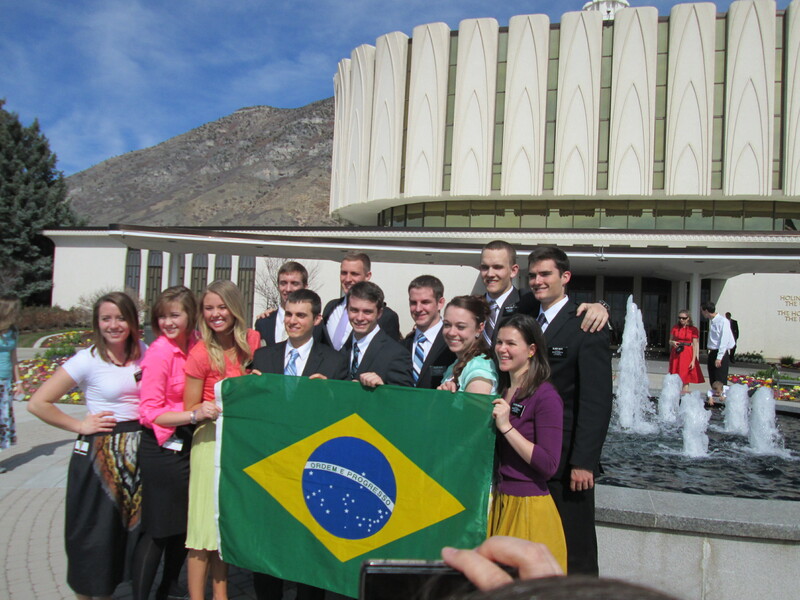 I am grateful for the message that I get to share with everyone as a missionary. I wouldn’t share it if I didn’t believe it was true….and you all know I’m not getting paid or receiving school credit for this. No, I want to make it clear. I am serving the Lord as a missionary because I want to help and invite others to come unto Christ. Why? Because He is the way. Other things can give us joy, pleasure, satisfaction, excitement etc. but to remain in a state of contentment, peace, and fulfillment never to disappear/fade with time ONLY comes through the gospel of Jesus Christ. That’s it. To put it simply, that’s why I’m here. Eu sou grato por meu Salvador, Jesus Cristo,em Ele eu seria nada. Ele e O Somente Uma. Eu amo voces. Ate Mais. Alright this week! So we’ll start with saturday. We had TRC training resource center-I think? Where you teach other investigators besides the ones you normally teach each week. Sadly the assignments got messed up so we ended up only teaching one lesson (normally you teach 2) and we taught our teacher rather than new people. Not a bad thing but I was excited to go into a lesson meeting someone brand new just as if you met right off the street. Still a cool experience, my companions and I are really striving to have the spirit with us as we teach and to really try and discern the needs of our investigators. We talked with our teacher about prayer and trying to help him strengthen that part of his life with Heavenly Father. PRAYER IS MUITO IMPORTANTE 🙂 And I will better illustrate this point here in a couple paragraphs down from this one 😉 you shall see…tehe. I was reading in Jesus The Christ in my personal study-such an incredible book. There are a lot of big words that I don’t understand but as soon as I look them up my mind is just blown away by the understanding and the significance of what I’m reading. It is awesome. Anyways, I was going to share about what I read in one of the chapters. It was about how Christ taught in parables. So neat. I loved reading about the parable of the Soil and then then the sower-they’re both similar but have very important messages 🙂 Yay for parables! Later saturday night we had a mini movie night after add. study where we watched some Mormon Messages-those clips are SWEET! A few minutes of pure goodness every day 🙂 One we watched that really hit home for me was called “Mountains to Climb” talking about trials and building our faith in Christ. It is SO good. Please please watch it if you have a chance. I was crying like a little girl I was so moved. Through the Savior Jesus Christ, we really can get through anything and have confidence that the Lord has a purpose for each and every one of us. What a blessing to know that-sounds like the Plan of Salvation? Mmm Hmm ya, I think so people! Sunday was a bit rough. 3 of the girls in our district woke up way sick 😦 Nao bom. 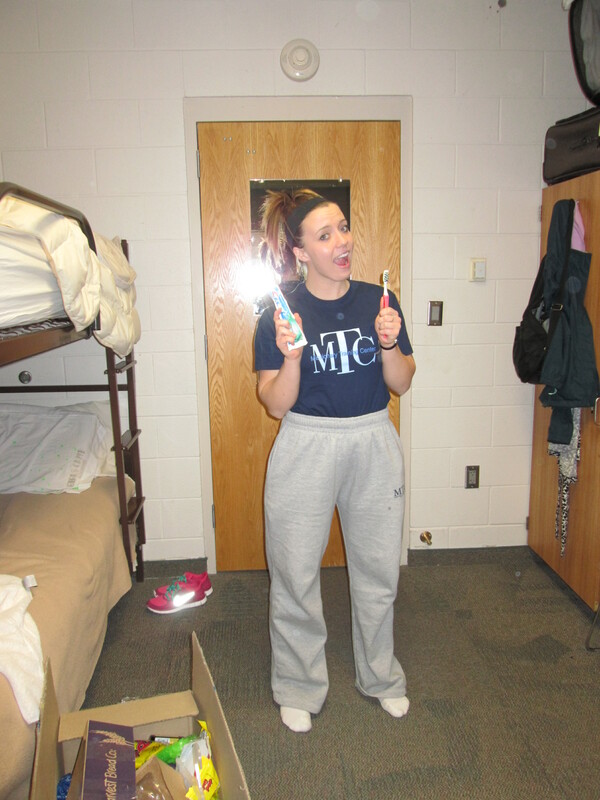 So Sister Dana (she’s from AZ) went on an exchange while the other 3 stayed in bed. 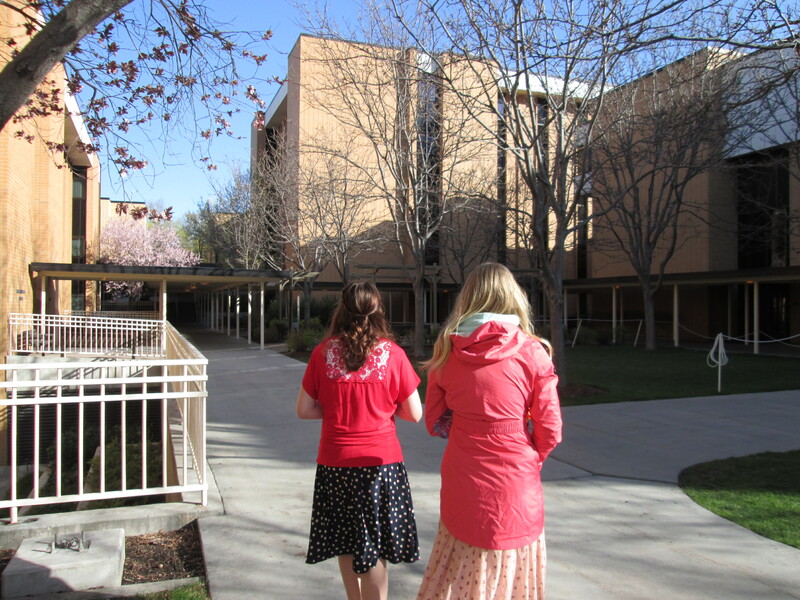 We went to Relief Society (here at the mtc it’s one big meeting with ALL the sisters-whew!). The woman that spoke was Sister. Edmuonds, and oh my goodness what a bombshell. She’s a lot like Sheri Dew/Elder Holland haha. Straight up, forward but reproves with love etc. I love it. She served 4 missions and talked to us all about the blessings that we’ll receive and life long+more lessons that we’ll learn as missionaries. I know I’ve already learned so much. 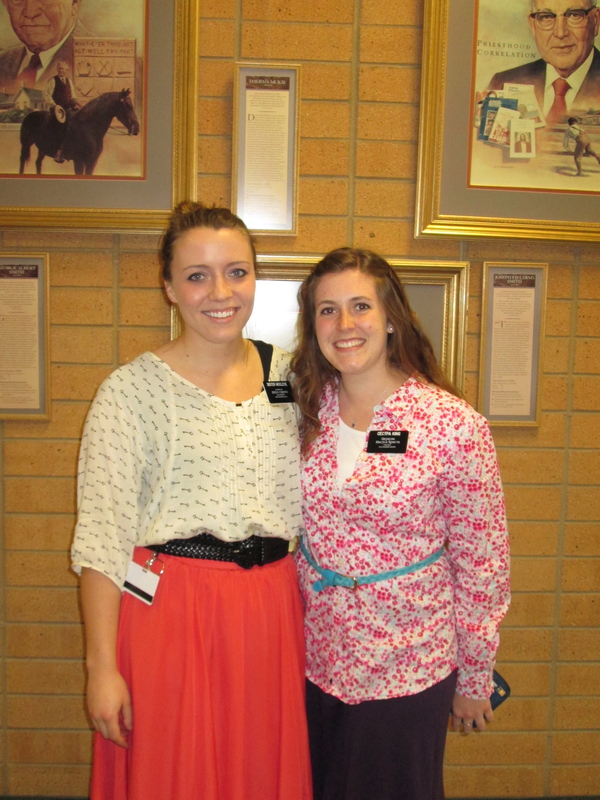 I think the most powerful moment for me during her talk was when she held up a journal from one of her missions. It was 702 pages long. It looked like a Harry potter book it was soooo thick. She then told us that if she had quit and gone home when it was hard (which is your whole mission. in case I didn’t make it clear before MISSIONS ARE HARD) she wouldn’t have all of those pages. She held up what she thought would be 3 months worth of entries and to see the contrast of the lack of pages that remained compared to before was a really good visual aid. She encouraged us to rely on the Lord and promised us that yes, homesickness would subside, the language would come, we will find people to teach AS we continue to dedicate ourselves to the Lord and HIS work. I would love to meet and chat with her sometime. She is so inspiring, and funny. Sister Dana turned to me during the meeting and said “You’re totally going to be like her someday”, best compliment I’ve received in a while I thought to myself haha. Later for sunday evening devotional we got to hear from Brother Droubay who is over the media of the MTC and is involved with the media/campaigns of the church. He talked to us about how the Lord really is hastening His work, and we’re right in the middle of it! How cool! He used the reference D&C 88:73. His work, in His time….well I think that’s another prophecy being fulfilled and then some. Mission age change? Then adding 58 new missions!? Another MTC in mexico? This is happening people. There are people to teach that want to hear of this gospel and be apart of it because it does BLESS FAMILIES! He talked more with us about how they had a “Christmas is..” campaign in NYC and bought some billboards and busses, taxi toppers in times square to advertise the mormons are christians and what Christmas really is all about. There was a billboard below ours that was from an atheist group that read “Keep the merry (with pictures of santa and presents), forget the myth! (a picture of Christ with a thorn of crowns)”. Pretty sad to see that, but even so mormon.org has received much more attention as non members are curious and wanting to ask questions and see what we believe. It is a wonderful site to share with friends and others that aren’t familiar with our faith. And of course to see that Mormons are normal functioning likable, peculiar but not crazy people 😉 There’s another campaign beginning in London that just started in april continuing with “I’m a mormon” we’ve been covering “tube” stations in London, we’re seen on double decker busses as well. It’s exciting and cool to see how creative the church is but very dilligent in missionary work even with technology which can be a HUGE blessing when used in productive ways 🙂 Sunday night we watched a movie called “Joseph Smith Prophet of the Restoration” and it was told by Lucy Mack’s perspective (joseph’s mother). I had never seen it before. SO amazing. I believe it’s one of the newer films so if you have a chance to watch it at a visitors center or rent it from a library ask for that movie from Lucy mack’s perspective. The actors are all the same as one of the other films but it’s different. So powerful and inspiring. Joseph Smith truly was a prophet of God. I’ve come to know that for myself but honestly, He could not have done what He did without the Lord. And the early saints of the church and the persecution they faced because of their beliefs. They couldn’t even worship in peace. It just breaks my heart but at the same time these early saints pressed forward not being moved. They were FIRM in the FAITH and relied on Heavenly Father. We too can and should follow their example, no matter what troubles or opposition faces us, we can receive constant nourishment and strength every day as we pray-with real intent, read our scriptures, serve others and strive to do God’s will. We will be fortified, and can say with confidence “I believe in Christ, so come what may”. Okay to finish we’ll have story time, this may or may not make history in the McCleve family as to one of the funniest/coolest stories ever. Sooo I shall talk about that in the few minutes I have left. So I think I mentioned in my last email that I was invited to say the prayer at devotional this tuesday? Well I was, by my bishop. So he said for tuesday night’s devotional will you give the opening prayer? and of course I told him I’d love to. I asked him if he knew was coming to speak and he said they don’t tell you until the speaker themselves show up. So I had no idea who was coming that night. He told me my companions and I would sit on the stand for that devotional too, in front of the whole MTC, 3000 missionaries! CRAZY! Okay so tuesday night rolled around. We arrive early and were told how it would all work. I then found out that I was giving the closing prayer and not the opening, slightly more nervous now as I knew that I would be waiting longer therefor more anxiety to build up-awesome (sarcasm). The meeting started…and in walked…..Elder yes Elder Richard G. Scott. Yes an apostle! Now all speakers at devo’s are amazing and wonderful but this is the first time I got to hear an apostle speak to our group of missionaries since I’ve been here at the MTC. Anyways I felt even MORE nervous knowing that I had to follow up and pray after HE spoke (remember this is an apostle here people). But I prayed so hard and knew that all would be well…or so I thought 😉 As the meeting began and he spoke I came to realize that the topic he was going to share was…prayer believe it or not. Again this led to my heart rate rising, palms sweating as I realized that I would now be the very next person to pray (in front of 3000 people+ an apostle) after he spoke about prayer. It was a wonderful talk though. I did take notes and wanted to make sure I at least remembered a few things even though I was beyond nervous. I love that he talked about 3 ways our prayers are answered. 2. Comes a little later/through someone else or a thought that randomly pops into our mind etc. 3. When our answer doesn’t come right away or even a little later to a point where we think we will never get an answer. He assured us that this is because really, the Lord trusts us and wants us to grow in Faith. He knows that if He gives us an answer right away or the way we want it, that there would’ve been lessons learned that would have gone astray because we didn’t exercise enough faith and patience in Him. To receive an answer in His time and in His way. I hope that makes sense. Basically, the Lord wants us to grow and to be stretched so we can really reach our full potential-how can that happen? We get out of our comfort zone, we experience the unexpected, we have to be patient and HUMBLE. Continuing to seek for God’s will. For example(and this is my-mackenzie’s example not Elder Scott’s) when we don’t get an answer right away we might normally say “Okay Heavenly Father, I’m still waiting for you to answer my question about…..or I don’t know what to do please just tell me what to do so i can do it!? etc.” but perhaps if we try to pray with TRUST in the Lord, with a proactive, stepping into darkness attitude with faith, the Lord will manifest what He wants for us. I know this is true. We need to trust Him more and exercise more faith rather than being told/confirmed on every little thing that we should do. The Lord wants us to choose and use our agency, as long as we follow Him. I hope that makes sense. Just wanted to share that. Okay back to the story! Okay he ends his talk. We sing the closing hymn (which I thought would never end oh my goodness haha). I get up to say the prayer, I’m focused on that podium, I’m an obedient missionary going to give a closing prayer in front of 3000 people (these are the thoughts running through my head). Right as I’m about to reach the mic. I see a figure out of the corner of my walk over in my direction. I thought it was the MTC president having to read an announcement that he forgot about or something. I looked right as we were about to run into eachother because I was till walking and it was Elder Scott, yes he was cutting me off to get to the microphone first hahahaha. He looked at me (remember this is in front of the whole MTC) put up his first finger and said with a smile and that cute little twinkle has always has in his eyes “Sorry just one more thing I wanted to say”. I-stunned, slowly backed away thinking he was just going to say a couple words. I then realized that I was still standing awkwardly behind him and therefore you could see me on the big screen where the camera was recording. Funniest image of my life engrained in my head. I took a couple more steps back (the audience now giggling) and still saw that half of my body was on camera and my expression could clearly explain how I was feeling. Finally I shuffled back and sat back down as Elder Scott wanted to share a few more feelings with us. About how our mission calls are inspired and we are truly called by a prophet of God, President Monson.Every single mission call is divine. I have to go. But thanks again for all the support, love and prayers especially ( I feel strength every day from them). I hope you all know how much I love this gospel and how blessed I feel to have this opportunity to be a missionary of the Lord for this period in my life. To have my own journal of experiences of people I meet, teach and grow to love so much. I love this work. I love being a missionary even though it really is the hardest thing I’ve ever done, but I wouldn’t want to be anywhere else right now. Eu te amo voces. Eu orar para voces todos dias. Eu sou grato por este evangelho, O Evangelho de Jesus Cristo. 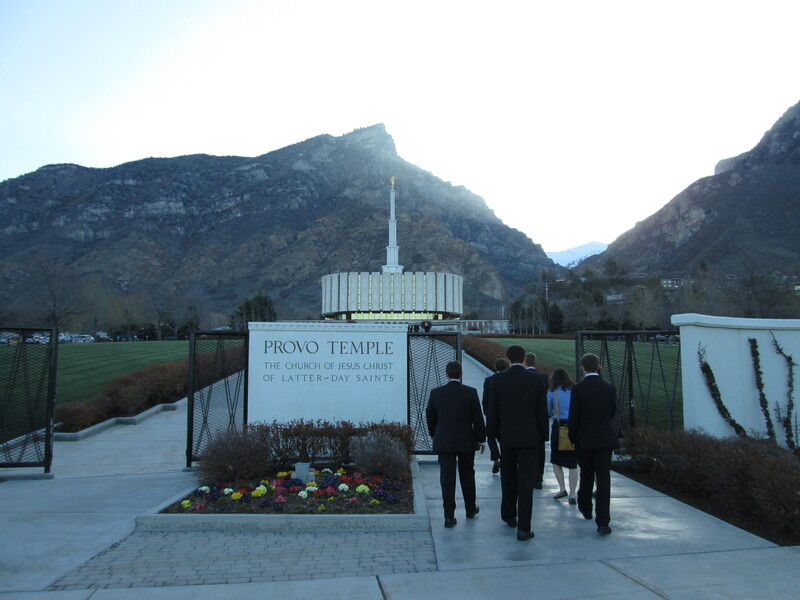 In front of the Provo temple with my district. We are all waiting for our Visas. Okay so I guess this is my 2nd email but technically my 3rd week? Anyways hi! Thanks for the letters, I feel so loved! I’ve heard from so many different friends and family and it just makes my world light up. I’ve never felt so socially isolated in my life haha. I love hearing about everything going on back at home. Well first of all I’m still here, alive, well breathing. Not sick at all anymore so that is a plus. I just realized I forgot to bring my journal that I would use to kind of outline what I’d say…pits. I guess I’m just going to be rummaging through my brain here for the next little bit trying to tell you all about this last week. As we draw near to Christ, so He does with us. But we need to reach out to Him. I made an effort to prayerfully consider a couple questions going into conference and to have them answered. They were and I am so grateful for the power of prayer. I know that those talks/topics were inspired. I’m so grateful for modern day revelation and for the guidance and admonition that our church leaders give us. Ps. I LOVED Dallin H. Oak’s talk about the new testament stories of the Savior and how today our church exemplifies that as well. So good. This week we taught 2 new investigators. Joaquim and Marcello. Marcello is a bit more expressive and seems to really enjoy learning about the Book of Mormon. But again I can only understand so much. Often times our trio comes out of a lesson comparing what each of us thought we heard haha. We have to work together to put together what our investigator needs or just details about him. Learning a new language has been beyond humbling haha but I love it. And I’m so grateful that I get to learn a new language. Although I’ve been told by natives that are here in the MTC that the portuguese we learn here really won’t do much for us once we get to Recife….oh boy. Oh well, it’s all part of the experience right!? Neat experience happened with Marcello in our 2nd lesson about the restoration. I had just been working on memorizing the first vision quote in PMG. But with our lesson plan Sister Remy was going to talk more about the first vision and she was going to recite that line. The lesson seemed to be going fine as each of us mustered out broken phrases in portuguese to this oh so patient investigator. I turned to Sister Remy giving her a nod for her to go ahead and say her part but she shook her head. Sister Orr and I both looked at eachother not knowing what to do….I then felt prompted to go ahead and recite that quote myself. Slowly but surely I did, and the next thing I knew I was overwhelmed with emotion. As soon as I finished quoting Joseph I then bore my testimony of the truthfulness of the restoration and that Joseph Smith did see God the Father and His Son Jesus Christ. I wish I could describe how I felt. But words fail me to do so entirely. I just felt conviction, integrity and without a shadow of a doubt that what I was testifying us was true. I’m so grateful for that experience, I know that the spirit is EAGER to be that witness of truth as we share our testimonies with others. To see the light in Marcellos eyes as I shared my testimony with him, I wanted that moment to last. You know when someone is feeling the spirit and receiving truth that touches their heart. The atmosphere in the room completely changed in a matter of seconds. I can’t believe that I get the privilege to share this message of truth and HAPPINESS with other people that “are looking for the truth, but know not where to find it”.I know this gospel is true and blesses families. It does nothing but good for everyone. Why wouldn’t someone want that? I have to get going but I wanted to end on an experience that will forever remain close to my heart. 🙂 I love you all thanks again so much for your love and support. Being a missionary is the hardest thing I’ve EVER done in my life, but the blessings are beyond what I feel I deserve. 🙂 The Lord loves us, all of us. Thanks for everything and remember that when times are tough-SERVE someone! 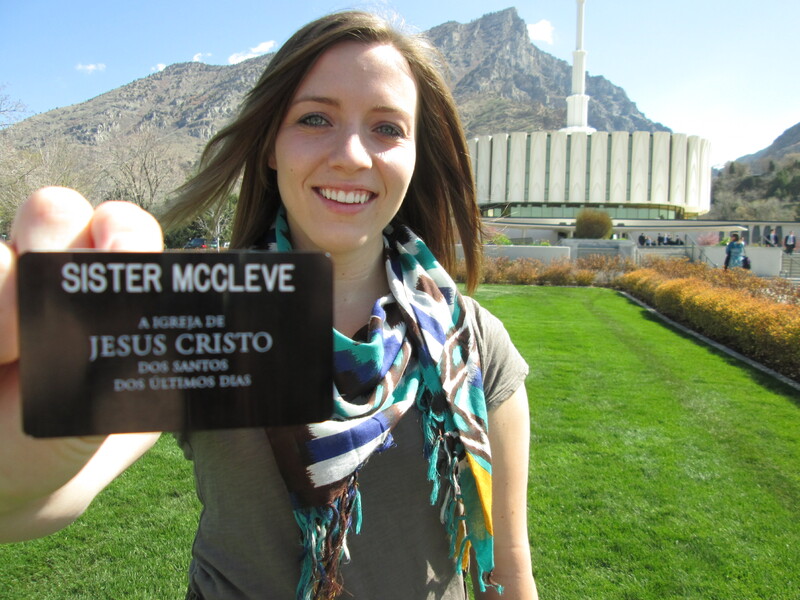 Sister McCleve (mick-lev-ee) haha I think I’ve forgotten how to say my name in an american accent. Oi! oh my goodness I don’t even know where to begin. First thank you so much for your letters, they have brightened up my day and I’ve really enjoyed hearing about what everyone has been up to… Savior of the World sounded like it ended on a good note-nice. That production was wonderful. There was a story told the other day I can’t remember if it was in a devotional or class but they talked about doubting Thomas and His faith in the Savior. Such an inspiring story. I know that each of us have stepped in his shoes in our lives but we can learn to have a trial of our faith first. Then comes the miracle. The Lord works that way, otherwise it’d be too easy. We have to learn to TRUST Him. Also please write me letters (hand written) or on dear elder because I can get those every day here. I had so many emails to respond to and I didn’t have time to get to them all 😦 sorry! So until I get to the field letters work best thank you. Ps. No visa yet but I’ll keep you all posted on that:) So for now I’m still here at the MTC in provo for another 5 weeks. Okay Geoffrey is going to Brazil?? Which Mission? When does he report? I found out from Aunt Ruth in a dear elder so if it was supposed to be a suprise…sorry haha. That’s so exciting. I haven’t heard from him yet with any details…eh hem. So tell him to write me please! I bet that was so crazy. I would’ve never guessed Brazil. YOU’LL LOVE PORTUGUESE! It’s da best 🙂 Parabens Smurf! Class that day consisted of our teacher Brother Perkes speaking in portuguese straight for a solid 2 hours. Most of us just sat and listened with eyes wide or jaws dropped (take your pick). You’re just so overwhelmed with the reality that you’re finally a missionary and ON A MISSION that everything seems so trippy. Surreal? Dream-like? honestly I kep thinking I’d wake up and be back home haha. Strange. But I can assure you it’s finally starting to sink in. Going to bed wednesday night I was rather happy, excited and overwhlemed but generally happy. I think I spoke to soon when I wrote you guys that first letter home haha. Thursday/friday/saturday hmm we had a branch presidency meeting-nice to meet them but we ended up having to write down a ton of goals and so I left the meeting that night even more stressed. I woke up feeling more sick (tuesday morning I had a sore throat) and well, my voice was shot so I basically sounded more like a man that I normally do. Joy. It even cracked as I tried to muster out some portuguese phrases-haha my companions enjoyed that. Time schedule adjustment and emotions still whirring around in my head. We did however start teaching an investigator named Henrique (En-heek-ey) to practice teaching. I can tell you right now, although it was a “role play” teaching brings the spirit. Here I was only here for 2 days and I was baring my testimony in very very very broken/simple/grammatically incorrect portuguese and yet I knew that the spirit was there and it was so strong. And Henrique understood I learned soon in the MTC that the spirit is eager to be that witness of truth to everyone of the truthfulness of this gospel. Easter Sunday was wonderful. Everyone kept telling me “Oh just wait until Sunday, just wait until SUnday” and well it makes sense. Sunday was amazing. We had one big sacrament meeting with all 3000 missionaries and Elder Causse the presiding bishop was there with his family. Cool story about this: So we had been waiting in line to get seats for this sacrament meeting since we knew a general authority would be there. However as soon as we got in people were saving spots and randomly getting more people coming in etc. basically-everything filled up before we knew it and we were about to leave to go to one of the overflow rooms because everyone had to be in a seat not just standing in the back or on the floor somewhere in the gym. I was so sad and then all of a sudden my companion sister Orr who also had been running around looking for seats waved at us pointing to a lady who held up 6 fingers down below. We ran down the stairs (we were at the top of the bleachers) as the opening Hymn began and an usher came up to us and led us to….the very front row. Yes. I sat in the front row to hear Elder Causse of the presiding bishopric speak and I SAT NEXT TO HIS PARENTS! Miracle? I think so. One moment we thought we’d be sitting in some overflow room and the next we’re in the front row right in front of the speaker. Ah 🙂 Such a wonderful talk on easter. I love this time of year, it’s much more important than Christmas in my opinion since we celebrate the Savior Living. His ressurection was a crowning event after the atonement. Afterwards we talked with His parents who are from Bordeaux (dad they were soooo french you would’ve had a field day talking to them). And even later on (just to make the story that much better) when we were in a branch testimony meeting Sister Orr had to go to the bathroom in the middle of it and my companion and I grudgingly agreed to go with her. Well as wer were waiting for Sister Orr, Sister Remy and I looked down the hall and walking towards us was the MTC president, his wife and Bishop Causse and his whole family including the parents we talked to earlier. We got to shake each of their hands and say hi to them as they passed us smiling. They complimented us on our service. AH SO COOL! I tried to speak french, but it didn’t work out that well, they seemed pleased that I tried though. Their accents were so heavy, ah loved it. French is awesome, apart from Portuguse. So yes, sunday was a great day obviously haha. nSheri Dew spoke that night to us in a devotional that was phenomenal. She’s such a spiritual bombshell I love her. We also listened to Elder Bednar’s talk on The character of Christ-incredible. Changed my life. I love you all so much thank you for your prayers and love. It means so much to me. Remember that this is the Lord’s work. And it will continue to go forward. I’m so grateful to be apart of it. Ps. can I have the hoyts address? I never got it. Hello! Oh my gosh I can’t believe I’m already writing you guys my first letter home! Today has been nuts. And that is no exaggeration whatsoever. But don’t fret, it’s a good nuts. The MTC is…busy, very very very busy and you know why? Because this is the Lord’s work and there are things to be learned and shared! Today felt like a dream. It still does, I keep thinking that I’m in a dream and that tomorrow I’ll wake up from it all. I love it here, I know it’s where I’m supposed to be. It’s a lot more organized than I expected. Kind of reminds me of EFY in a way, like orientation day when ALL the kids come and us counselors were beyond busy, ha ha good times. I sometimes feel like I’ m a counselor again, just at random moments. Anyways I’m hand writing this letter because my P-day (preparation-day) is on Friday here at the MTC (so you’ll get my 1st e-mail, next Friday! and pics hopefully!). However, we don’t get to email this P-day (so the 29th) just because. So this is my letter to let you all know that I’m happy, safe, and very confident in knowing that this is where the Lord wants me. There are a lot of things I’m adjusting to, like calling men “Elders” and girls “Sisters” even if I know them. I’ve seen Sam King, Jessie Wengert and Sean Escobar. I actually shouted his name super loud “Sean!” and then he whirled around both surprised and I think horrified ha ha. So I’m getting better with missionary titles. My district is awesome, there are 14 of us…I think and it seems that many of us are soccer players-cool. We sisters (5 of us) all bonded instantly as if we’ve been friends forever, I already feel so blessed because we all get along great and they’re all so solid in the gospel-it’s sweet! My companion is Sister Orr from Draper, Utah and she’s so funny. Kinda spazzy (gets distracted easily ha ha) but has a sweet testimony of the Savior. She snorts when she laughs too ha ha and she knows soooo many missionaries here because she’s a local. Today we had orientation and class time where my teacher was just rollin’ out the Portuguese. I’m glad I took French because there are definitely similarities between the Latin based languages. We start teaching tomorrow in Portuguese! Crazy but I know if I work my tail off and focus on my purpose, the Lord will help me. As we open our mouths they will be filled. So true. I love you all and I look forward to sharing more about my experience here next Friday. This is the Lord’s work, I know He’s hastening it too, there are people that are waiting to hear the “good news.” And I get the incredible opportunity to share that. PS Chette I just need addresses for the thank-you cards so I can send them off. Por favor, obrigada! PPPS If you want to type this letter up and post it in my blog that would be great thanks!